Put 3 x 500g prepared Butternut Squash and sweet potatoes into a large roasting tin. Drizzle with 3tbsp olive oi, 2tbsp sage leaves and 2tsp yellow mustard seeds, if you like. Roast at 200C, Gas 6 for 50 mins until tender and golden. 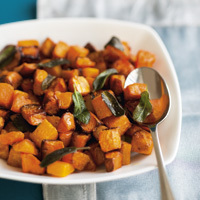 We like; Asda Butternut Squash and Sweet Potato with parsley and black pepper, £2 for 500g.